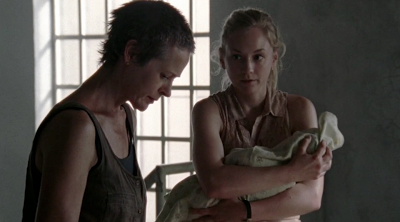 Beth brings Baby Judith to see Carol as she scrubs out a makeshift mailbox bassinet. Beth confides that Judith would have died if Daryl had not raced out to find formula. She expresses anger that Daryl has left the Group for Merle. 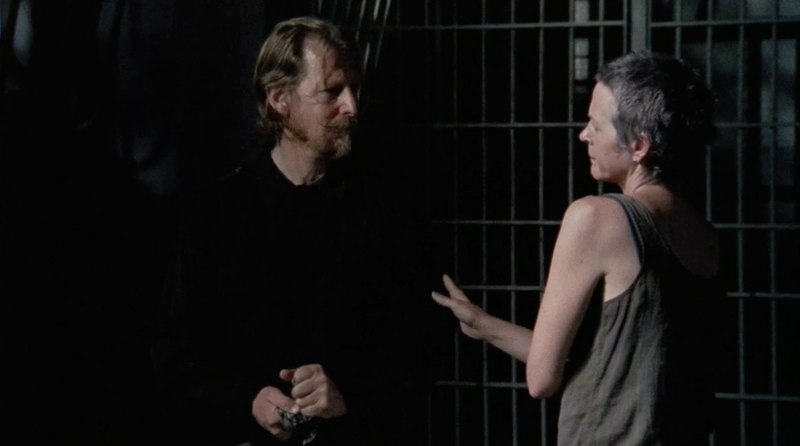 Carol jumps to his defense and explains that Merle has a psychological hold on his younger brother. 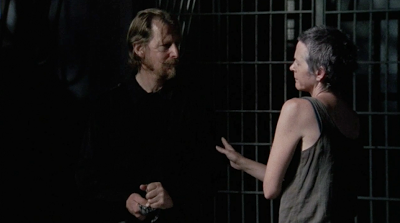 Regardless of Merle's shortcomings, Daryl lived his life by a code of conduct that he had to honor. That meant putting his family first. Despite her grief at losing him, Carol is determined that they will survive this latest blow. Later, as Axel mourns the loss of Oscar, Carol tries her best to console him as she did Beth. The introduction of the new group is the final setback. 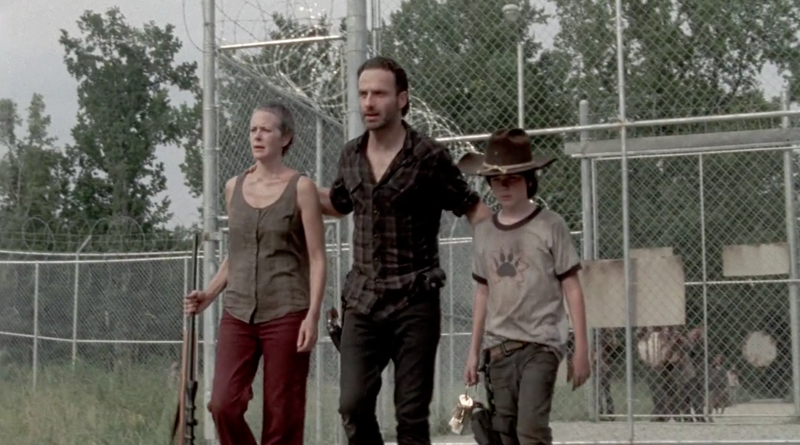 Rick is immediately suspicious of them and angry at Carl for leading them to the cellblock. 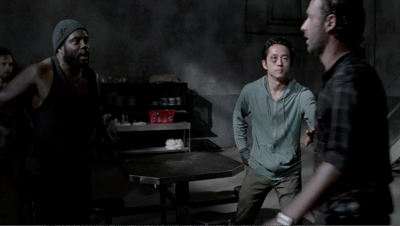 Rick begins shouting and screaming at Tyreese. Glenn urges them to just leave as Hershel tries to calm Rick and determine what caused his outburst. The Group would have insisted that Rick rest and eat. Lack of sleep and nutrition could cause erratic behavior in anyone. The heartbroken Axel could not possibly have prepared dinner. 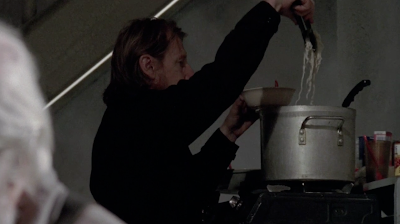 Hershel, no doubt, took charge and pulled canned and packaged goods out of their pantry. 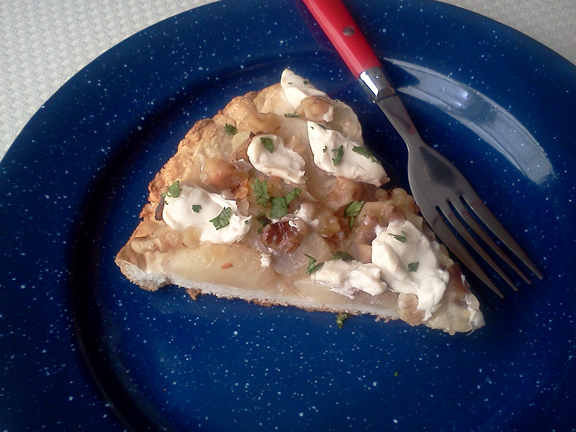 Bartlett Pear and Blue Cheese Tart is very simple to prepare. Jarred Roka Blue Cheese Spread is the perfect foil for canned Bartlett Pears and walnuts. And the shortbread crust is the ideal way to showcase the fruit and cheese filling. And when the dead rise; if anyone in your group screams at the thin air…run…do not walk…to the nearest exit. *If walnuts are stale; you may toast them lightly over medium heat or coals to restore their flavor. This really works; trust me. If you have a working oven; preheat to 400°F. Alternately, heat campfire coals until red hot and allow to burn until covered with white ash. Grease a pie tin or a 9-inch baking pan with shortening. 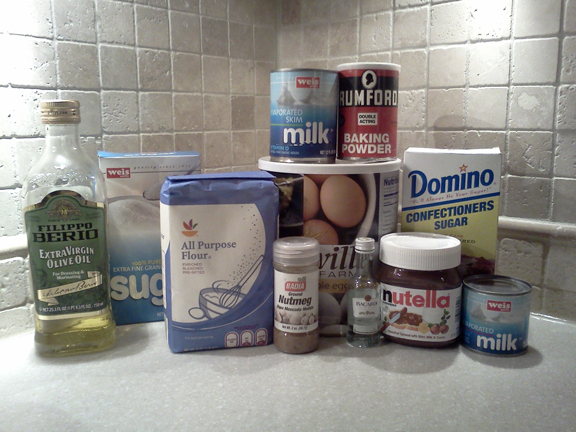 In a large bowl, combine baking mix, water and shortening. Blend well until mixture comes together in a ball. Gently (grease fingers if necessary) pat the dough into the bottom and sides (about 1 inch up) of the pie tin or baking pan. Bake for 10 minutes in oven or 15 minutes (sealed well in foil) over campfire. Remove from oven/fire while you prepare the filling. In a small saucepan, melt the shortening. Add minced, dried onion and allow to simmer VERY briefly. The moisture in the shortening will also allow the onion to reconstitute slightly. Remove from heat and set aside. Slice each pear half into fourths and layer the slices in concentric circles in the tart crust. Use all of the pears. Using a spoon, drizzle the onion mixture over the pears. Bake in preheated oven for 20-22 minutes. Alternately, seal well with foil and cook over campfire coals for 15 minutes, checking often so the tart crust does not burn. Remove from oven/fire. Sprinkle chopped walnuts over tart and bake for an additional 5 minutes. Remove from oven/fire again. Using a small spoon, drop teaspoonfuls of the Roka Blue Cheese Spread evenly over tart. Sprinkle with dried parsley flakes. 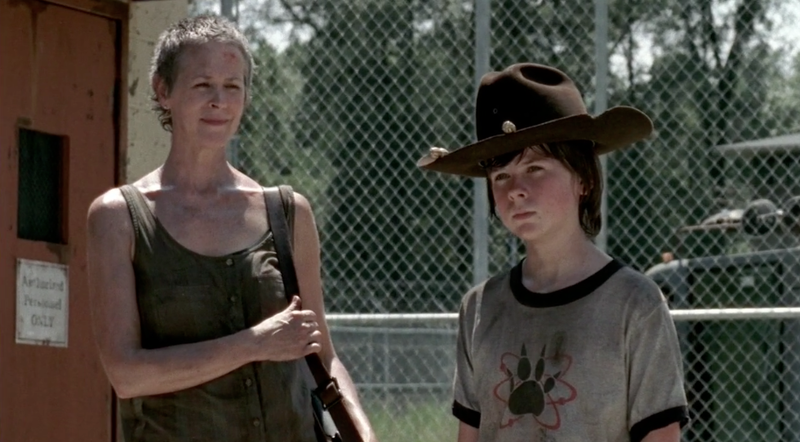 Carol and Carl keep watch and wait eagerly for the return of their Group from Woodbury. They are filled with relief to see the Hyundai finally pull up to the gates. 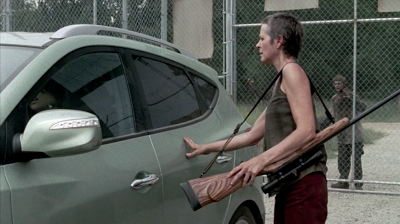 Carol notices Daryl's absence immediately as Rick exits the car. 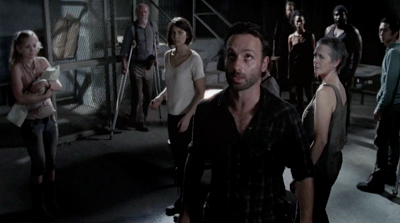 Rick explains that in addition to finding Maggie and Glenn, they also ran into Merle Dixon. 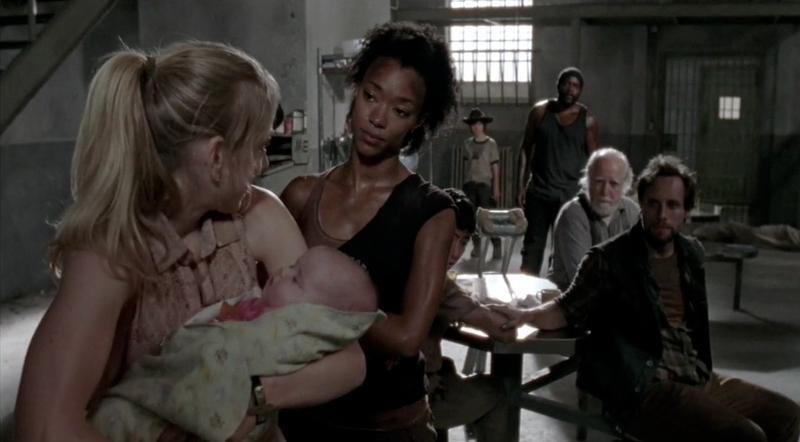 And that Daryl left with his older brother. Carol is crushed by the revelation. 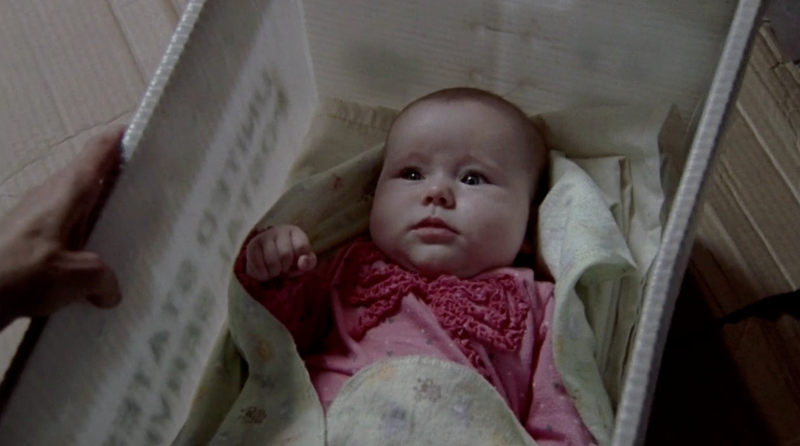 Along with the loss of Daryl, they learn that Oscar was killed in the raid. Rick offers what comfort he can as the three of them return to the prison. After Rick gets a moment alone with Hershel, he tells the older man even more disturbing news. 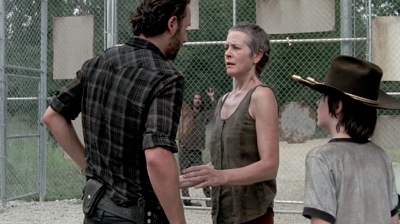 Merle and Daryl were being held in an "arena" and were being pitted against each other. A crowd was present and cheering for a fight to the death. And the self-proclaimed "Governor" was presiding over the spectacle. 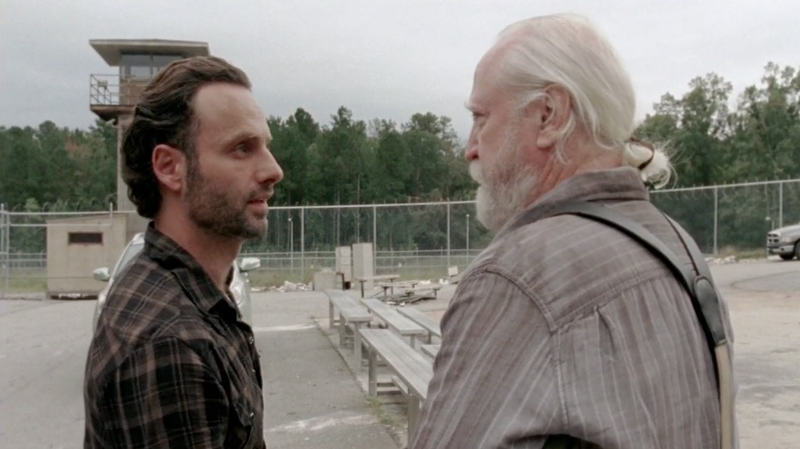 Hershel tells Rick that this "Governor" is a product of their new world. Hershel would no doubt urge Rick to come inside and eat something. Axel had plenty of leftovers from lunch and had also made a sweet dessert to go with their Sambal Noodle lunch. 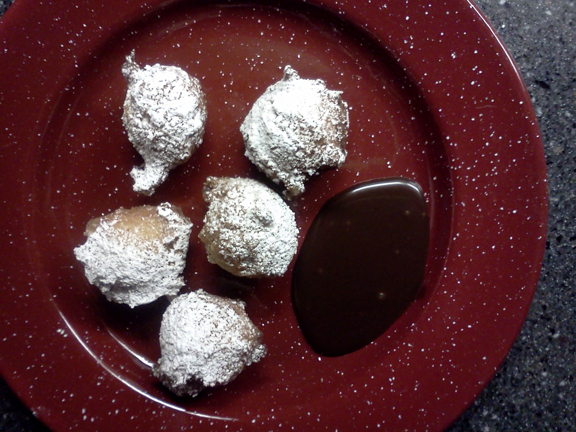 Beignets with Chocolate Rum Sauce are a unique and memorable dessert or snack that can be easily made from 8 ingredients. Made famous in New Orleans, Louisiana; these beignets will become a favorite no matter where your group is from. 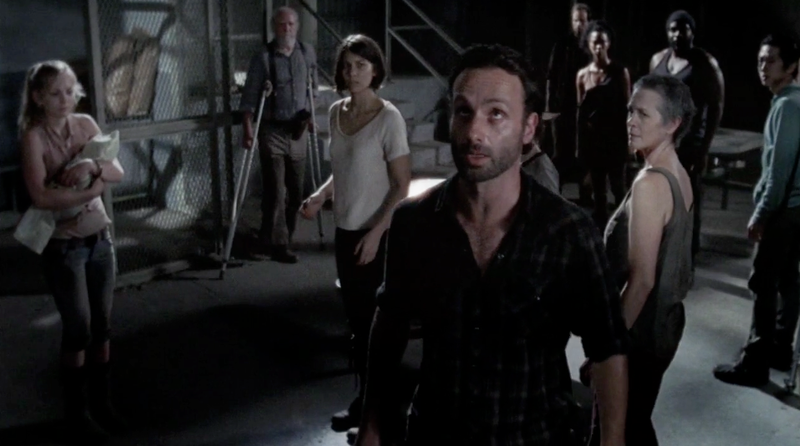 And when the dead rise; if you get a shot at the Governor…take it. Pour about 2 inches of oil into a heavy saucepan or large Dutch oven. Heat over medium heat (or medium coals) until oil reaches about 360°F. 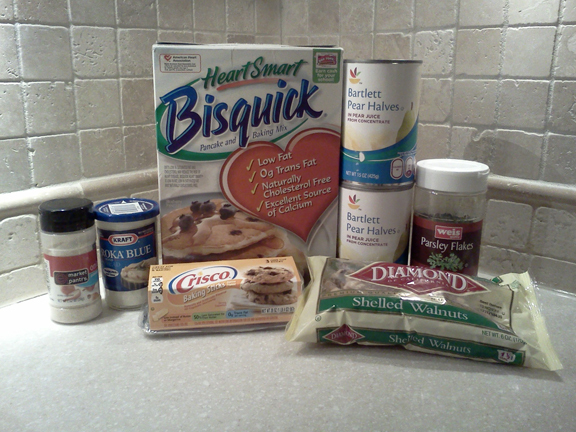 In a large mixing bowl, combine flour, sugar, baking powder, and nutmeg. Stir well until combined. Stir in the reconstituted eggs, olive oil and evaporated milk and blend until the mixture resembles biscuit dough and clings together. Lightly sprinkle flour on a flat (and clean) surface. Turn out the beignet dough onto flour and sprinkle with additional flour. Lightly knead the dough three or four times. Using a spoon, scoop out dough portions about 1/2 inch in diameter. Drop two or three beignets into hot oil. Fry two minutes on the first side and turn dough over (carefully) using metal tongs or a slotted metal spoon. Cook for an additional two minutes. Using the slotted spoon, remove the beignets to a dry towel or strainer to drain the excess oil. Fry the rest of the beignets the same way. Only cook a few at a time to avoid cooling the oil. Sprinkle with powdered sugar and serve with Chocolate Rum Sauce for dipping. Combine all ingredients in a medium saucepan. Heat over medium heat (or alternately, over medium coals). Stir gently until combined and smooth. Don't allow to boil; just heat gently. Serve in a small bowl with warm beignets. Carl, Hershel, Beth and Carol play host to the group of newcomers. 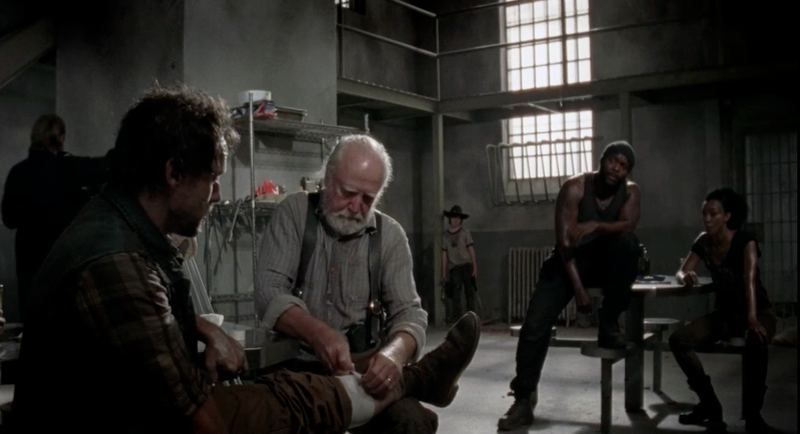 While Hershel provides medical care to them, Carl secures their cellblock. The new guests (consisting of Tyreese, Sasha, Allen and Ben) are intrigued to learn that Hershel survived a Walker bite and that the Prison Group has a new baby. 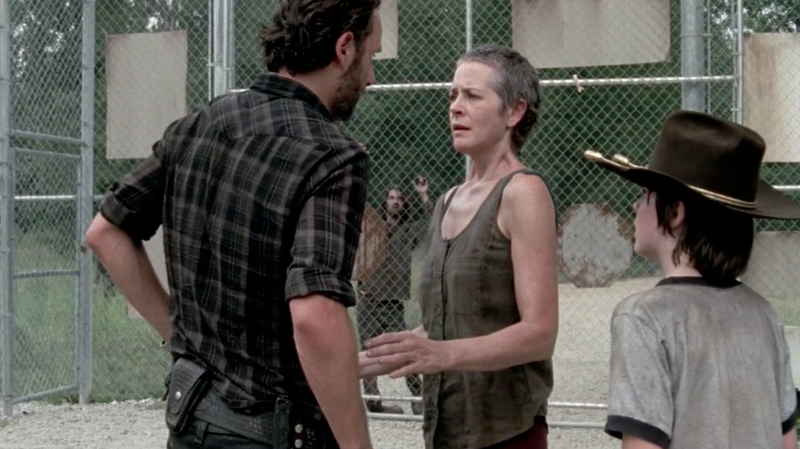 Hershel politely reminds Tyreese that Rick is the Prison Group's leader. And that their stay may not be permanent. 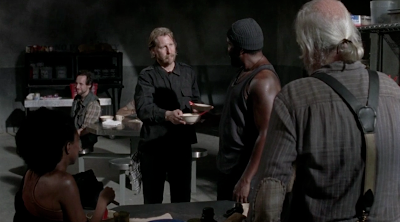 Axel fixes a meal as they all get to know one another. With four more mouths to feed, Axel prepared a hearty pasta dish. 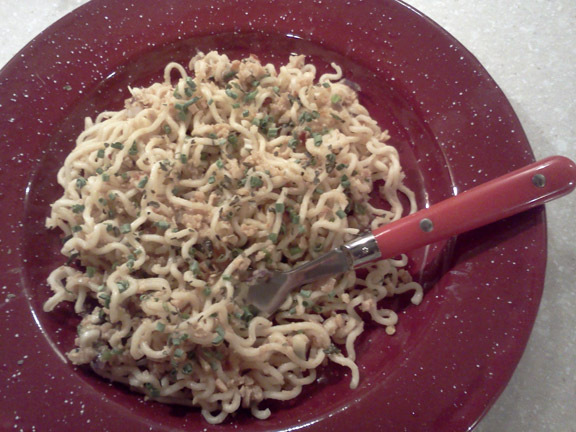 The humble noodle is elevated to new heights with the addition of just a few seasonings and TVP. 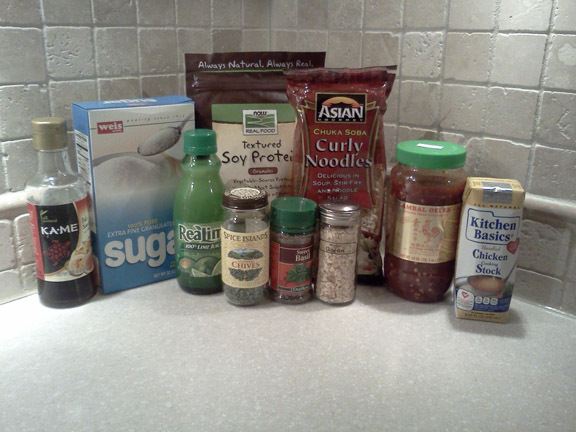 Lime juice, Sambal, Fish Sauce and sugar combine to create an almost restaurant quality meal. Your group won't believe how delicious this easy dish is. And when the dead rise; if your crazy neighbor Jerry has a bunker under his shed…and he lets you stay in it…don't leave even if you run out of stuff!! For the Sauce: In a small bowl, mix Sambal, fish sauce, lime juice, sugar, dried chives and basil. Stir well until sugar is dissolved. For the TVP: In a small saucepan, mix stock, minced dried onion and TVP. Stir well and allow to come to a boil over medium heat (or medium-hot campfire coals). Remove from heat and allow to sit for 15 minutes, or until softened. Prepare noodles according to package directions and drain well after cooking. Pour drained noodles into a large bowl. Pour the sauce mixture and TVP and onion mixture over the noodles. Using tongs or two large forks, toss the mixture well, making sure the noodles are well coated. Serve immediately and sprinkle with additional chives if desired.